Cormorant Point is a 55+ neighborhood in Sebring, Florida. This active adult subdivision is located within the master-planned Golf Hammock community. Residents enjoy low-maintenance homes in a beautifully landscaped setting, and some homes enjoy scenic views of the 18-hole Ron Garl championship golf course. Homeowners living in Cormorant Point have the option to purchase a membership to enjoy the pool and golf amenities at the Golf Hammock clubhouse. Ideally situated in Highlands County, residents are never far from daily conveniences and attractions. Lake Jackson, Highlands Hammock State Park, and horse riding stables are just some of the fun things to do in charming Sebring, Florida. Although Cormorant Point doesn't have its own amenities, 55+ residents can purchase an optional membership to use the pool and golf amenities in Golf Hammock. The clubhouse of Golf Hammock provides plenty of social spaces where neighbors can get together for fun activities and events. Homeowners can socialize in the multi-purpose room, grab a bite to eat in the restaurant, or buy the latest gear in the pro shop. Residents will also love the indoor golf practice facilities that are perfect for honing their skills before heading out to the course. Outside, active adults can take a dip in the pool or lounge on the patio. Neighbors can challenge each other on the tennis courts or wind down with a leisurely stroll on the walking and biking trails that surround the community. There is an R.V. parking facility that residents can use for an additional fee. The main attraction in Golf Hammock is the 18-hole Ron Garl championship golf course. Golfers can purchase an optional membership or pay green fees to enjoy the par 72 course with multiple tees designed to challenge players of all skill levels. Before playing a round of golf, residents can utilize the putting green, chipping area, practice bunker, or driving range. Cormorant Point was developed between 1981 and 2007. Homebuyers can choose from attached or single-family home designs that offer one-story living and low-maintenance exteriors. Some homes enjoy beautiful views of the golf course or scenic lakes and ponds. There are a few attached villas in Cormorant Point. They range in size from approximately 1,390 to 2,297 square feet with two bedrooms, two bathrooms, and an attached one-and-a-half or two-car garage. These villas feature spacious layouts, carpeting, light and bright kitchens, updated appliances, large living and dining room combinations, and screened lanais. Buyers who want more space and privacy can select from a variety of single-family homes. They offer approximately 1,193 to 2,779 square feet with two bedrooms, two or two-and-a-half bathrooms, and an attached two-car garage. These spacious floor plans offer large living rooms with cathedral ceilings, eat-in kitchens, dining rooms, plenty of cabinet space, modern appliances, dens, large master suites with walk-in closets, double bowl vanities in master bathrooms, and a front covered porch. Active adults living in Cormorant Point can be as busy or social as they wish. Residents pay an affordable homeowners' association (HOA) fee that covers lawn care. Some homeowners pay an additional HOA fee to the master association that includes golf and amenities. Thanks to the HOA taking care of tedious yard work, active adults can spend their days pursuing fun hobbies, exploring the neighborhood, or taking day trips with family and friends. Cormorant Point provides homeowners with all that Central Florida has to offer. Major roads like Highway 98 as well as everyday conveniences are nearby. Just a few minutes away residents can find a Sears, Lakeshore Mall, Bealls Department Store, Walmart Supercenter, and Kmart. There are plenty of recreational opportunities and attractions close by as well like Lake Jackson, Lake Sebring, Highlands Hammock State Park, several golf courses, Sebring International Raceway, and horse riding stables. Homeowners can take road trips to Avon Park that can be reached in 20 minutes, Winter Haven that's an hour's drive, or Lakeland that is about an hour-and-a-half away. For long distance travel, residents can fly out of Sebring Regional Airport or Sarasota-Bradenton International Airport. 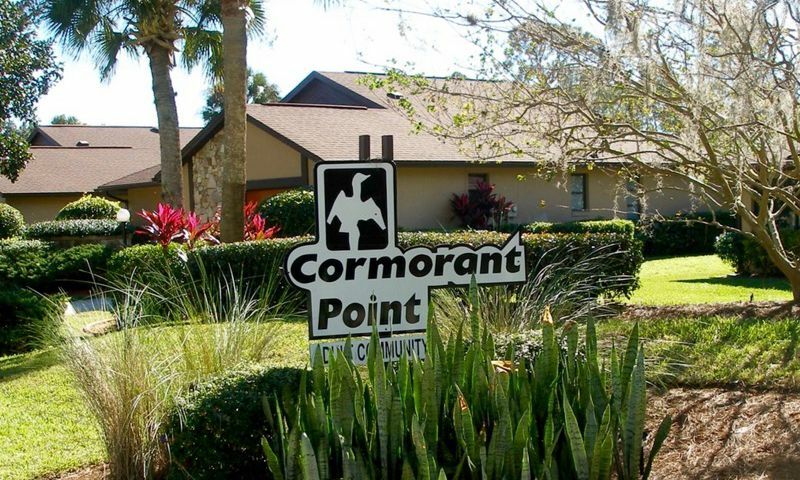 Active adults will love the quiet and welcoming 55+ community in Cormorant Point as well as its convenient location close to plenty of attractions in Highlands County, Florida. 55+ residents can purchase an optional membership to use the pool and golf amenities in Golf Hammock. There are plenty of activities available in Cormorant Point. Here is a sample of some of the clubs, activities and classes offered here. There are a few attached villas in Cormorant Point. They range in size from approximately 1,390 to 2,297 square feet with two bedrooms, two bathrooms, and an attached one-and-a-half or two-car garage. These villas feature spacious layouts, carpeting, light and bright kitchens, updated appliances, large living and dining room combinations, and screened lanais. Please Note: Floor plans are not available at this time. Buyers who want more space and privacy can select from a variety of single-family homes. They offer approximately 1,193 to 2,779 square feet with two bedrooms, two or two-and-a-half bathrooms, and an attached two-car garage. These spacious floor plans offer large living rooms with cathedral ceilings, eat-in kitchens, dining rooms, plenty of cabinet space, modern appliances, dens, large master suites with walk-in closets, double bowl vanities in master bathrooms, and a front covered porch. Please Note: Floor plans are not available at this time. The community no longer has a pool. The owner of the golf course filled it in. The tennis courts are unplayable. The golf course is a decent course. 55places.com is not affiliated with the developer(s) or homeowners association of Cormorant Point. The information you submit is distributed to a 55places.com Partner Agent, who is a licensed real estate agent. The information regarding Cormorant Point has not been verified or approved by the developer or homeowners association. Please verify all information prior to purchasing. 55places.com is not responsible for any errors regarding the information displayed on this website.